This form stopped accepting submissions on October 27, 2018 9:00 am CDT. “Blacksmith 1″ spans two days and will be held for both members and nonmembers of the museum and is designed for those with no metal working experience. 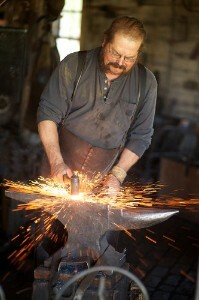 During this class, participants will create items using a coal forge as well as become skilled at the tempering process and basic hammer techniques. This class is a unique opportunity to find out how metalworking was done over one hundred years ago and how blacksmithing is still relevant today. Those who participate will walk away with their own tools they will have created during the class. You must be 14 years or older to participate. The cost is $120 for members and $130 for nonmembers. The instructor is Randy Dack. For more information, call (308) 385-5316. This form stopped accepting submissions on November 3, 2018 9:00 am CDT.